This will be a really FUN top to wear, we can't wait. 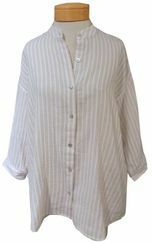 Eileen Fisher's cotton gauze is a wonderful fabric, and how she has paired it with this mandarin collar, button front shirt is perfection. 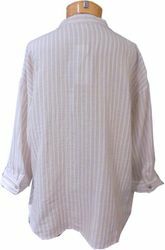 The 3/4 sleeves have narrow banding and button closure, giving it a refined, dressier look. You could easily wear it casual, rolling up the sleeves a bit, wearing the button front partially undone with a sleek cami under it. Whether you are mixing this with your favorite worn in jeans, or tailored linen trousers, this top will prove to be the beautiful piece that will make the outfit become "wow".